The Ace of Wands in a Tarot reading represents the power of creation including new ventures and beginnings, birth and parentage. It could also indicate inheritance or making financial gains. In the reversed position it could mean the opposite a serious fall leading to ruin. Creation, invention, enterprise, the powers which result in these; principle, beginning, source; birth, family, origin, and in a sense the virility which is behind them; the starting point of enterprises; according to another account, money, fortune, inheritance. Fall, decadence, ruin, perdition, to perish also a certain clouded joy. Ace of Sceptres – Birth, Commencement, Beginning, Origin, Source. Persecution, Pursuits Voilence, Vexation, Cruelty, Tyranny. Birth, source, principle, beginning, origin, cause, reason, creation, invention. Some say also: family, but this is probably to be taken as ‘family-descent,’ or parentage or origin of the family, which is a different idea. Reversed: Fall, perdition, decadence, decline, ruin, etc. The element of Air on the First house or ascendant has of course to do with birth and beginning, because it is the coming through of the message from above to the regions of the physical plane; the ascendant indeed is the synthesised appearance of the heavens at the beginning of . . . whatever it may be, and so this card signifies on one hand the inflow of light from above into the world of matter and fact, which can have several meanings. On the other hand, seen from the side of light itself, it is the ‘fall in matter’ and the decline of the higher, as well as the enlightening of the lower. The cards of the airy element have always and in every instance a double meaning and not only in the sense of right and reversed, but a meaning on two sides. And apparently this has been wrongly introduced as ‘right’ or ‘reversed’ in some cases. So the ace of wands will represent the effect of suddenness, of the incidental, even accidental, showing some appearances of the planet Uranus. It denotes something that is making its appearance all of a sudden; a sort of manifestation, creation such as the birth of a child. This, by the way, is generally considered to be a joy for the parents, etc., but may not be for the soul, which has to accept once more the limitations of life in a body of earth. And this is the two-sidedness of the significance. The triangle is black, but radiant, symbolizing the Radiant Darkness or Potential Energy in which all beginning, symbolized by the white, dotted circle, concentrates itself. The white circle symbolizes Kether, the Hebrew idea of the number 1, called the Crown, or Primal Will. Another symbol shows the circle, Unity, the Spiritual Triad or Triangle, and the Square of the Lower Quaternary, indicating that the card represents the life-power in man. Behind the Ace (which symbolizes the concentration of Spiritual Fire for works of creation) is a sun rising over the horizon of the waters of creation, and this sun also suggests the dawn, or beginning of a matter. 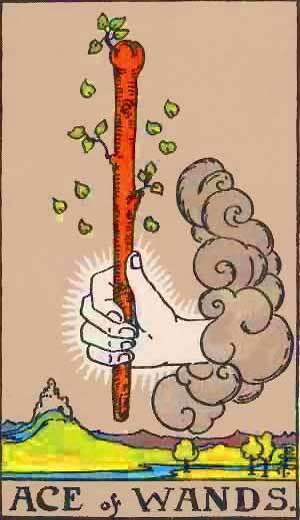 Astrologically the Ace of Wands governs the quarter of the Heavens from Aries 0 to the last degree of Gemini. March 21st to June 20th, inclusive. The Root of the Powers of Fire. Natural, as opposed to invoked, force. Strength, force, vigor, vitality, and particularly the force of concentrated Will. The principle, or beginning of an enterprise. More information on the Ace of Wands Tarot card. This entry was posted in Tarot, Runes and Divination and tagged ace of wands, astrology, darkness, earth, feelings, love, money, occult, tarot, the world. Bookmark the permalink.